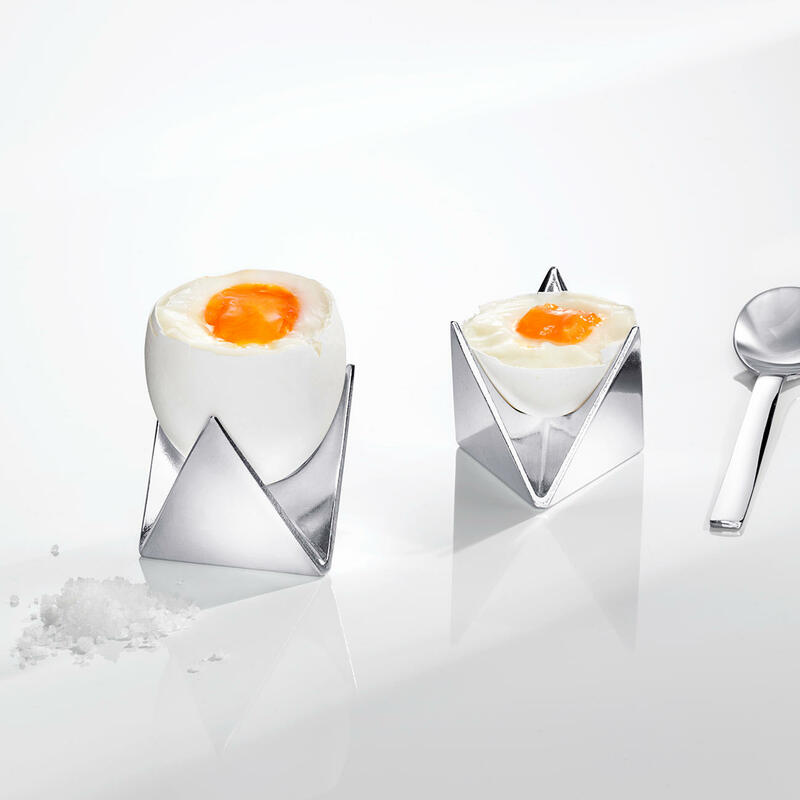 Wonderfully practical with two useful items: Two egg cups in one object. Carefully held as though by hand. Egg cup? Sculpture? Delightful subterfuge. By Alessi. The best utility art from the famous Italian design studio. Artfully shaped from silvery aluminium, it looks like a piece of modern sculpture. Set on a sideboard, windowsill, table or shelf, nobody will guess what it is actually for. The conundrum is only revealed when you prepare your breakfast egg. The trick is the two matching halves that are each made up of three precisely interlocking triangles. Placed one on top of the other, the two halves join to form a perfect whole. Everyone will be surprised when you lift off the upper half of the sculpture and reveal the secret: Top and bottom turn out to be two egg cups. The sides of the two egg cups are formed by three triangles which have curved grooves on the inside. The shape that this creates exactly matches the oval of the egg – and holds it particularly gently. Holds two boiled eggs of any size. Or the top and bottom of a cut-off egg. Due to the gaps between the triangles, the eggs or egg halves are easy to take out – even the smaller lid of the egg. Both modules are made in aluminium with the finest finish, so please only wash by hand. 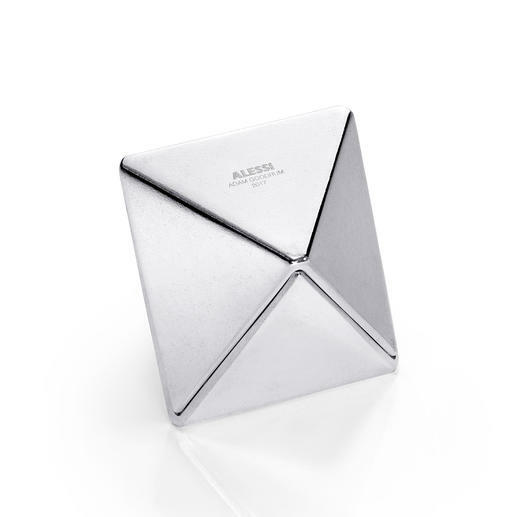 Designed for Alessi by multiple award-winning designer Adam Goodrum. Measures a compact 4.5 x 4.5 x 4.5cm (1.8" x 1.8" x 1.8"). Weighs approx. 110g (4 oz).